"Why settle? Why choose the practical thing, the mundane thing? We are born to dream and make the things we dream about." "This is the life you're living. It's not temporary and it's not pretend and there's no do-over." "...stars are more than just poetic. If you need to, you can navigate your way by them." The basic plot of this book is not unique: guy and girl meet by coincidence (or fate) and fall in love and have this crazy connection after only a few hours. 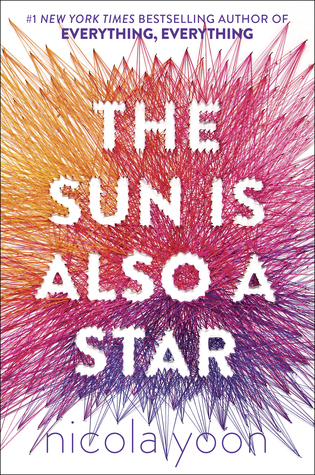 However, Nicola Yoon makes it unique by using diverse characters with diverse cultural backgrounds and by infusing the writing with her fun and humorous but serious style. (It was somewhat reminiscent of Eleanor & Park.) It was definitely a page turner! One of the things I liked the most about this read was the diversity with the two main characters coming from Korean and Jamaican cultures. It was refreshing, too, to see the world through the eyes of Natasha and her family who are not what you typically imagine when you think of illegal immigrants. I love a book that yanks me out of my own life experiences and forces me to examine those of others. What is the American dream today? What's it like for immigrants trying to pursue that in our current culture? Natasha and Daniel's families provided insight into these questions. I liked how the chapters rotated between Natasha and Daniel and other side characters (and sometimes they provided background on the history of a subject). I like seeing how the pieces fit together, how an action touches another person's life, and the difference you can make in someone's life even if you don't see it. The idea that we're connected in our humanity regardless of race or age or economic status, that we all speak the same language when it comes to our need for love and acceptance, that people often lash out because they cannot accept themselves, and that redemption is possible are just some of the concepts Yoon's book conveys. I also loved the two main characters, Daniel and Natasha. Natasha reminded me so much of myself, and over and over again I said, "Yep, me too." Natasha is a logical girl who loves to talk about intellectual topics like dark matter and time travel. She loves to be precise and to analyze, and Daniel is her opposite. He's a dreamer and a poet, and he's anything but practical. I loved watching these characters interact and learn new ways of thinking about the world from each other. But I will say that the ending left me believing that people have a purpose in our lives, kindness matters, and nothing in this world is left up to chance.